New X-Series fastenings from global cable management specialist HellermannTyton are designed to provide peak performance while operating in extreme heat, sub-zero environments and inclement weather conditions, says the manufacturer. "Using inside serrated locking technology and delivering high tensile strength, X-Series fastenings ensure consistent peak performance," said Manufacturing Product Manager Richard Rands. 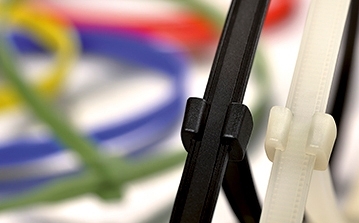 Cable management specialist, HellermannTyton, has addressed the need for greater control and safety within the food and pharmaceutical industry by expanding its extensive range to include metal detectable cable tie mounts. 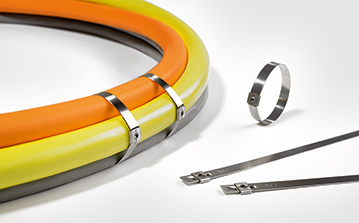 New from HellermannTyton, a leading supplier of products for fastening, fixing, identifying and protecting cables and their connecting components, is introducing a Metal Content Spiral Binding (MCSB) system with a metal content capable of being identified by x-ray as well as magnetic detection equipment on food processing lines. 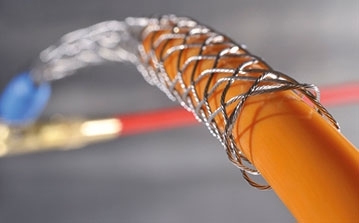 Developed to the specification standards of the US Food Drug Administration (FDA), the MCSB is easily applied to pre-terminated cables, encapsulating them in a protective jacket made from fully x-ray and magnetic detectable material. BAG A SOLUTION FOR THOSE TRICKY INSTALLATIONS HellermannTyton introduces Cable Scout+ New from HellermanTyton is the Cable Scout+ range, which combines its tried and trusted cable installation rod sets with a new extra-strong bag design. Included in the price of the Deluxe Set, the new improved bag features more pockets, allowing cable installers to carry more of what they need in just one piece of kit. 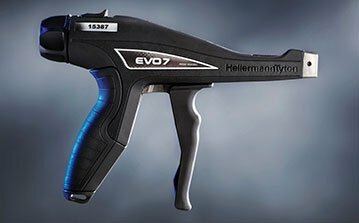 ‘TLC’ AND PROFITABILITY GO HAND IN HAND WITH EVO 7, SAYS HELLERMANNTYTON With its new EVO 7 cable tie application tool, global cable management specialist HellermannTyton has given a whole new meaning to ‘TLC’. Ground-breaking tension/lock/cut (TLC) technology means that, in line with four other new products, HellermannTyton has totally re-designed its applicator to not only maximise product benefits, but also further reduce risk of operator injury. Leading cable management specialist HellermannTyton has demonstrated its commitment to research and development with the launch of the new Q-series product range comprising cable ties, cable tie mounts and identification tags. REGULATIONS FOR FIRE RESISTANT CABLE SUPPORTS - WHAT YOU NEED TO KNOW! The IET is soon to publish a new amendment – the third - to the IET Wiring Regulations Seventeenth Edition (BS 7671:2008)*.